In 1993, some of the senior executives of the Vishakapatnam Steel Plant approached the Provincial authorities, requesting them to start an English Medium School at the Visakha Steel Plant Township offering a plot of land on lease for the same. On 20th April 1994, Vincentian Fathers officially began this work at Ukkunagaram. The first community at Ukkunagaram was constituted of Frs. Devassia Pudussery and Sunny Vadukumpadan. Rt. Rev. Simon Stuck, the Bishop of Jagadalpur blessed the house. The school was officially inaugurated on 15th June 1994. Initially the school functioned in the quarters of the Steel Plant leased to the Congregation. Fr. Devassia Pudussery was the Founder Principal of the School with Fr. Sunny Vadakumpadan working as the Bursar. The school had 17 staff and 320 students in the beginning. The following year the school was shifted to the present site in Sector VIII. His Excellency Rt. Rev. 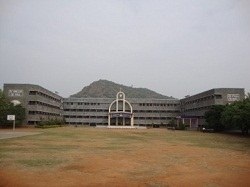 Dr. Mariadas MSFS, Bishop of Visakhapatnam blessed the new school building on 2nd April 1995. The school began functioning from 4th April 1995. The Vincentian community at Ukkunagaram was a part of Kannapuram House until it was erected an independent house in 1997 and Fr. John Mulackal was appointed the First Superior of the House.